NASB with Strong’s has taken me to new revelation. An amazing tool to help us rightly divide the Word. Be diligent to present yourself approved to God as a workman who does not need to be ashamed, accurately handling the word of truth. The Bible is, and was the best book ever written!!! I thoroughly satisfied using this app. 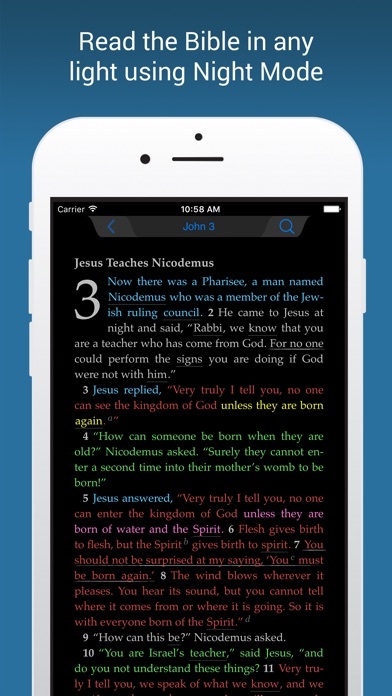 It has a lot good features; shows color when Jesus speaks, easy to read and much more. I use this every week and nearly daily due to its easy of use. No distraction from my study due to tech. This has been one of the best phone bibles I could find. Very user friendly. As a theology instructor and teacher of bible history I rely on quick and accurate teaching materials. Tecarta has become my Bible and discussion resource since 2010. With more than a dozen versions of Holy scripture at my fingertips I am never without biblical sources all while using a single device. There are dozens of bible study and commentary resources also available from Tecarta and I find these most helpful as well. So if you're looking for a single source for bible study you have found it! I have used it to prepare lessons as well as look at Scripture commentaries. Does much more than paper sources. Searches are made easy as well as cross references. I just love this app. I learn new things about it even after years of having it. I learned today that I can go into the folders I have made (with many scriptures), turn the phone sideways and it doesn’t completely take me out of the folders. Works great for me! Thanks for this app! I have been using several versions of the Tecarta Bible App for several years now and love it. It is simple to use with the ability to make notes, highlight and copy verses, and make folders and notes within. Great features but I have so many notes and folders now I need a search engine within the notes and folders and have been asking Tecarta to add this for years now. Seems like a simple fix to me and they keep telling me one is coming. Still waiting and have been for over three years now. Love the KJV version with the Strong’s app. It took me a while to learn to navigate the new app (why change the old it worked great). I like being able to read Bible passages from my iPad mini wherever I am as well as getting a passage a day to reflect upon. I’ve used it for years. This app is awesome. Everything I need in one place. I don’t have to use my data. I can get commentary and study bible notes. I can even write my own margin notes. It will underline and highlight too. There’s even a list of where my notes are. It’s easy and intuitive to use. I would recommend it to anyone looking for a good bible app. It makes my studies very efficient to find the verses fast. I read it daily and have learned so much! I think your app is number one. So I gave it one star. The word loving the psalms . The audio is very soothing and reassuring .Awesome. Love this app on my phone!!! Use it all the time! I have found this app to be very easy to navigate and logical with a lot of useful features. I tried three other apps before I found this one. They were very awkward and limited features. I would highly recommend the Tecarta Bible app. I use this bible app everyday. I’ve used it for at least a year now and it is a wonderful resource for me especially when I am looking for a new and different translation. I have one of the devotional bibles as well. It’s a great way to study Gods word. Trying to search 1 Corinthians and I get a “no search results” message. ?? We need both a 15 second back up button as well as a pause button so that if you leave either a part of the podcast or the entire app, you can either jump back or come back to the podcast in the same location when you do return. I purchased this app when I first got my iPod Touch many years ago, and now use it on my iPhone, and it has been an excellent app. Thank you for this on line bible. I use it every morning. Great way to read the entire bible in one year. This app puts everything at my fingertips for anytime I may need it. Since that’s the case, I use it to look up things I wouldn’t normally be able to if I’m away from home because I didn’t have my Bible. I love it! The daily scripture notification is a nice addition to add some of God’s words to the start of each day. Great app. You can read different translations online for free. Love it. You can listen to audio. Have to pay a small amount for some voices. 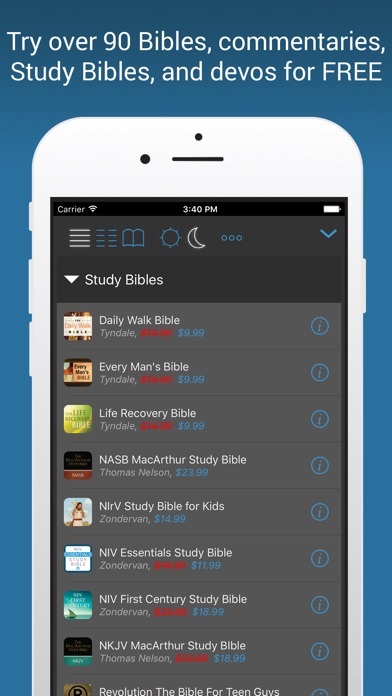 The capability to be able to carry a variety of Bible versions and Study Bibles in one app make it an efficient Bible study tool for all levels of Christianity. Love it! The daily devotional helps me to start my day right. I also love the sales of other versions of the Bible and commentaries. I wish there were more concordances so when I study I can look you certain words or meanings. I love this bible app! It’s my go to bible every Sunday because I can flip to the right passage fast enough but I don’t lose any conveniences I had with my actual bible like being able to take notes and highlight verses. My only wish would be able to underline AND highlight at the same time in the Bible as well as in my notes. Otherwise I love this app! I’ve switched phones even and had no problem getting my backup synced to my new phone. I’ve bought two other versions besides the KJV: the ESV and the NIV. I’ve even recommended this app to other church members. Also, I use the daily verse every single day. This is a great bible app and I highly recommend it!! I've used this app for bible reading for several years now. Easy navigation and also has the ability to share scripture verses via txt built into the app. I have been using this app for several years now and love all aspects of it. Easy to use, and I enjoy the side-by-side comparison view a lot to read two versions at once. Well worth it! So easy and convenient to use. I can take notes on the Sunday sermon and copy the bible text right in. I highly recommend. Love the scroll search, the copy & paste to email, cross references. It is extremely user friendly. I especially appreciate the tip of the day as it helps me to use the app more fully. Great to have my Bible so accessible. Thank you! Thanks for all the time and effort you guys put into this app. A pastor once said that the best Bible version is simply the one you'll read. With that said, with this app I have now read the Bible four times from cover to cover and am still reading it. This app enables convenient reading at home or on the go. Sharing verses with others is easy by utilizing the search feature. Of all the apps on my iPhone this one is definitely my must have. I've had this bible app for years, and kept on using it, I have other bible apps but kept on coming back to this, I love that they added more stuff to make it easier to incorporate the Bible in my busy life. But I also love their other products and use a lot of them too. Love this app. I use it to get daily scripture readings for life purposes and for direction. The word of the Lord is always uplifting. I love this app! It has very helpful and detailed information about the book and particular verses. My favorite by far, this app does everything I need without trying to be everything to everybody. The new enhancements are more than I need, but a great refreshing to a very, very, useful app. 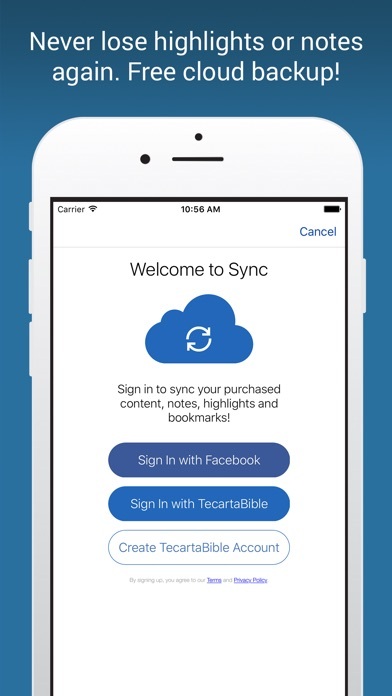 I really like the cloud feature and the ability to keep personal stuff across all devices. 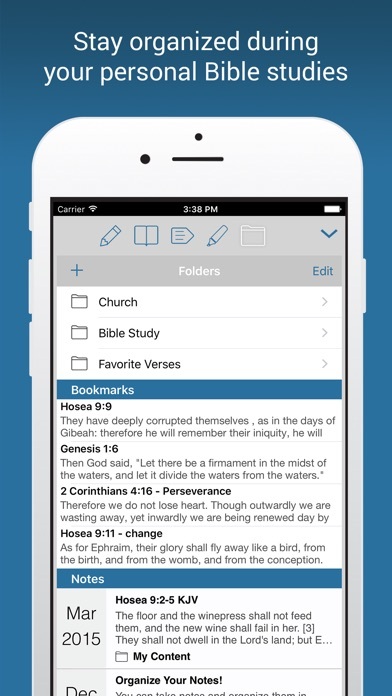 I track my scripture memory verses in this app, too. There's a lot of free apps out there for the Bible that are great but this one has a ton of value to it with its ability to take notes and organize them, also post scriptures to social media is very easy and works well and the extra content both free and paid for is great. Worth every penny. You won't regret it. So many times I remember a few words of a passage or have to jump between two or more passages. This app is extremely responsive, a joy to use! I really like this Bible app better than any other I've tried. I really enjoy the Life Application add-in. Worth every penny! I have been using this app for years now. It's my go-to. I have tried every Bible app with Traditional Chinese NIV on Android and iOS, Tecarta is among attractive ones albeit with only one Chinese bible, but it crashes every time I click “Calendar” in the trial devotion book, such bug prevents me from paying. This Bible app stands head and shoulders above any other that I have used. I have been a disciple for 24 years & have had the opportunity to assess many Bible apps and this assessment comes after many years of comparing and using this app. First of all, it is much more than just a Bible. 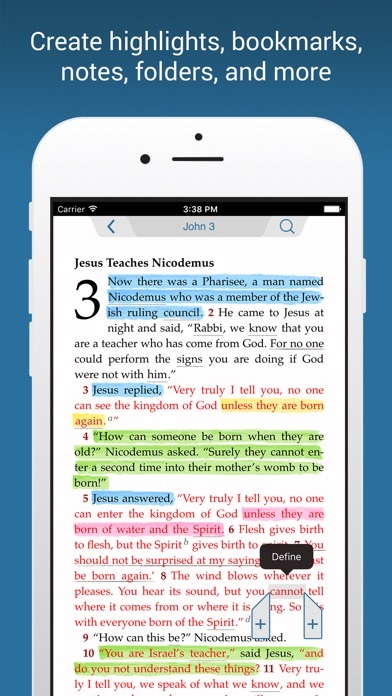 In addition to carrying as many versions of the Bible as you want to purchase, the app gives you many invaluable features - Many different versions available & ease of switching from one to the other - The ability to read 2 versions side-by-side - The ability to make margin notes - the ability to highlight scriptures (4 colors available) and to search by highlight colors - The ability to add cross-reference scriptures - The note-taking section which allows for the organization of notes into folders in addition to the notes - The feature of allowing the import of highlighted scripture into notes. This is an invaluable and not-often-imitated feature for when you are taking notes during a sermon. There are a few features I would like to see improved upon. I would love for there to be a way to open a desired folder by searching for its title in the note section of the app, without having to go back to the main set of of folders and work yourself down through your hierarchy of folders each time you want to switch from one folder to the next. I would also love an easier way to cross-reference 2 scriptures. In other words, have the wording of one scripture appear automatically next to its cross-reference counterpart. Would also like the Tecarta web site updated so that my folders and notes appear there as orderly as on my tablet. But still, this is an amazing app and I depend on it daily to assist me in my Ministry. Awesome bible going to put all versions on my iPad! I you it at church instead of my big bible! Love love!!! Easy to navigate. I use the search feature the most for putting together Bible studies. I love the option to try other translations. The best bible app I have used! Two things I really love is the option to do black and white. I can't stand reading at night with a white light background, so I definitely love the option to go back and fourth if needed. Another thing is the ease of note taking in the app, I use and iPad version and it makes it simple and efficient for me to put up and add a note on a specific verse or chapter. This app comes highly recommended, its worth every penny! Great app. Very useful for bible study. Good prices on bible translations. Good app. The new update with not load anymore. The website can not be located. Such a waste of money to pay for an update that won't work. Cannot believe the study bible I purchased now does not work. No updates, really? Unbelievable. I’ve been using this app daily for many years and so appreciate all the attention to detail. The new features and content continue to make it better. I particularly like being able to read multiple translations side by side along with commentaries. Being able to sync highlights and notes between my iPhone and iPad is great. I also enjoy the daily bible verse that pops up every morning to help start my day in the Word. Thank you for your faithful efforts. This is my first Bible app and it is very easy to use. Worth the price. Fantastic app! Worth the money. This app is definitely worth the money!